Mr. Ronnie James Dio left us a memorable legacy of great music, from ELF to Rainbow, from Sabbath to Heaven and Hell, his amazing voice helped to shape my favourite music genre. His solo career had many classic albums like the memorable debut Holy Diver or the metal anthem The Last in Line however my attempt at a short review goes to Dream Evil, probably his most underrated record. Vivian Campbell had just left the band to joined Whitesnake, so Dream Evil is Dio's first record without Campbell on the guitars, fact which worried many people back in 87, however Craig Goldy (ex Rough Cutt) did a great job replacing Campbell, so great that sometimes we think Vivian still playing. 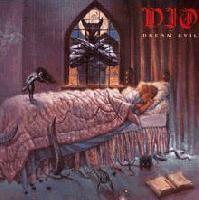 Dream Evil still has the commercial tendencies of the previous Sacred Heart, like the use of keyboards on some tracks (All the Fools Sailed Away) and the catchy melody lines (I Could Have Been a Dreamer), however Dio's fourth album is definitely more dark and heavy than its predecessor. The lyrics, as usual, are related to the supernatural and fantasy and the songs still have Dio's very unique signature based upon an extremely solid rhythm section performed by his long time mates Jimmy Bain and Vinny Appice. Dream Evil is a very consistent effort with memorable songs like the title track, Night People, the power ballad All the Fools Sailed Away, Naked in the Rain or the commercially oriented I Could Have Been a Dreamer, but my favourite moment here is definitely Sunset Superman, specially Craig's epic riff and the unbelievably catchy and powerful pre-chorus. Holy Diver and The Last in Line are Dio's most essential solo records however Dream Evil still is an absolute classic album in my book. Well...my first attempt at a short review guys. English is not my first language, so sorry for the basic sentences or any grammar mistakes. I rank Lock Up the Wolves a little higher than this one, but this is still a great album. His first five and Killing the Dragon are all I've bothered with owning. The rest are kinda meh. Review is short, like you said, but I liked it. Pos from me. I agree with you the first five and Killing the Dragon (that I really like) are Dio's best records. I think losing Campbell hurt the music a little, I didn't care too much for Craig Goldy's parts though they were serviceable. When they got Rowan Robertson for LOTW, I think he came with some fresh ideas that just clicked better with my ears. Well...In my opinion Craig Goldy almost cloned Vivian here. His solo scales and riffs are very similar to Vivian. I really like Craig's performance here, specially on Sunset Superman and All The Fools Sailed Away. Rowan Robertson have another style. A Totally different guitar player, but I also like is performance on LOTW, specially on the title track and Wild One. Not a bad review for a first, Notrap, especially considering English isn't your first language. For me the only guitarist after Campbell that really did anything for me was Doug Aldrich, who is one of my favourite guitar players. For Dio's discog, I stopped after realizing how meh Sacred Heart was. @JT Thanks man. Like you said, English is not my first language so it's hard for me to express myself on Shakespeare's language. I will try to improve next time. Doug Aldrich is an unbelievable guitar player. I'm a huge fan of his solo style. @Ire. Sacred Heart has some really good moments like Hungry for Heaven, King of Rock and Roll or Rock 'n' Roll Children. Like Cipieron said, don't underrate Dream Evil (one of his best albums imo) and give also Killing the Dragon a chance, a very cool record. the problem with sacred heart is that it has like 2 really awesome songs, a few cool songs and a lot of filler. Sacred Heart is the worst record of his classic era with fillers like Shoot Shoot or Fallen Angels, but don't miss this one, you probably will find some dated stuff, like the keyboards, but all songs are really catchy. You're saying talking/describing more each music? This album is slightly boring for me, not dio's best vocals either. But i agree with you that it is their last decent album anyhow. "not dio's best vocals either"
Really? I find the vocals here amazing. His performance on Sunset Superman or All The Fools Sailed Away is memorable. like fools overlove and dreamer; the rest is straight off the production line and a bit dull. After this i decided i did not need anymore dio albums. Excellent album, remember that it's 1987 production values! Craig Goldy plays his best here. great cover, too!